William Zielinski as cheesesteak man Nicky Grillo and Brian Cowden as policeman Stanley Drago in DOWN PAST PASSYUNK. Photo by Kathryn Raines. 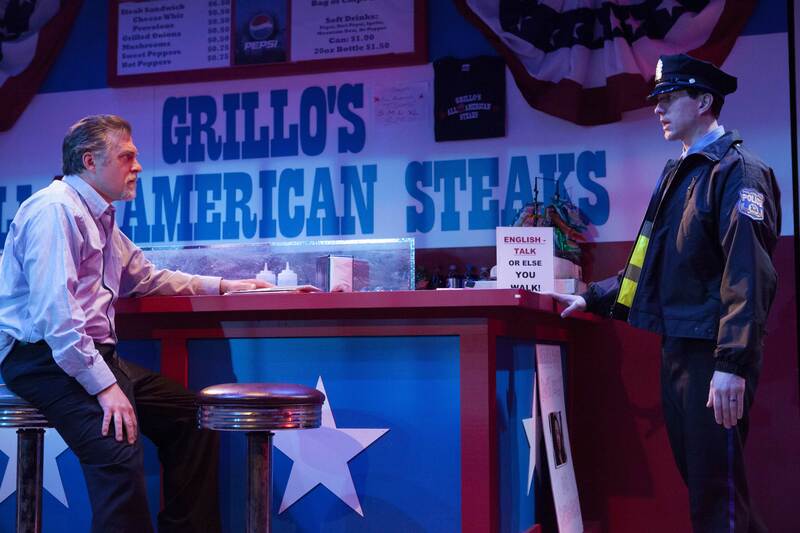 The play’s fictional sandwich shop, Grillo’s, seems like the kind of place that would make a mean steak. Family owned for 56 years, it is run by Nicky Grillo (William Zielinski), a fiercely proud South Philadelphian unimpressed with an influx of Spanish-speaking, possibly illegal, Mexican immigrants into his neighborhood. Nicky thinks they aren’t authentically part of the area, in the same way a hipster coffee shop owner (Alice Yorke) in the play’s pleasing denouement thinks newbie “rich people” don’t reflect the block’s working class roots. Echoing the controversy which surrounded Geno’s steaks a few years ago, Nicky refuses service to a young man who tries to order in Spanish. Faced with criticism, he responds with gung-ho patriotism, repainting in red, white, and blue and inserting “All American” into the store name, to the chagrin of his daughter Sophia (Alex Keiper), who thinks the neighborhood would rather see bike racks than stars and stripes. This is more than a South Philly tale, Williams attempts political theater for contemporary America. (My Philly pride hopes it sees stagings beyond the city!) But although he well captures the debate with an engaging dramatic story, there is little in his plot or the character’s politics to challenge us. 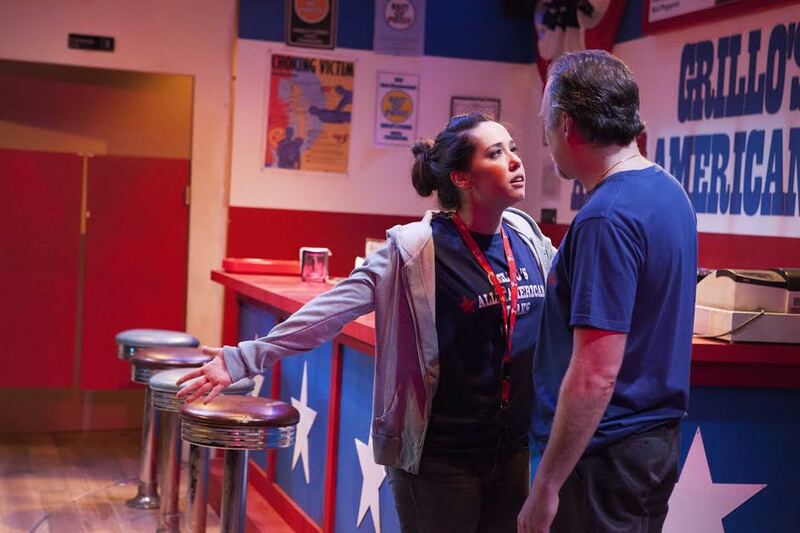 As liberal theatergoers, we’re meant to write-off Nicky’s blue collar racism. Williams doesn’t want us to do so easily. His lead is not a one-dimensional villain, and Zielinski’s powerful, controlled, and heart-rending performance brings a depth and life to the character beyond what is in the script. Matt Pfieffer’s direction is impeccable, his hand evident in Keiper’s “tornado” of a performance as the fiery Sophia and William Rahill’s show-stealing turn as their landlord Vince. Alex Keiper and William Zielinski in DOWN PAST PASSYUNK. Photo by Kathryn Raines. But for theater of politics to be really affecting, we need more than rationale for a character, we need authentic humanity. We don’t need to know that a racist character is a bad person, we need to know he is a person. Nicky’s racism is always protected by a self-rationalization (“I’m not racist” but this is our language, “I’m not racist” but coming here illegally is against the law), he never utters an epithet. And when tragedy visits his family and he (with apparent cause) feels his racism is justified, the audience is never permitted to consider this possibility. We are never forced to see Nicky as a man, recognizably human, recognizably flawed. Despite Zielinski’s efforts and Williams’s skill he remains classic stock character: the old man lost in a changing world. DOWN PAST PASSYUNK is entertaining and well-plotted. It is well acted and directed and eloquently staged on Ian Guzzone’s awesome rotating set. It brings real drama and interest to a hot political story. But it’s no South Philly corner deli cheesesteak. [Adrienne Theatre] April 4-27, 2014, interacttheatre.org. Christopher Munden is fond of South Philly tales: he is the editor of South Philly Fiction, a collection of short stories set in South Philadelphia and written by local authors.